Kourtney Kadashian's black & white striped living room. Bold, classic, and stylish. Those are the words I think of when I see black & white interiors. Whether you're a lover of classic decor or a fearless maximalist, black and white decor is one of those designs that you see in every style of home. It's not hard to understand why either. Since the main draw of black & white decor is contrast, it's easy to make a statement or design scheme by using only a couple decor pieces. Black & white interiors can range from the extremely bold (see Kourtney Kardashian's living room on the left) to minimal and classic. Check out some examples after the jump! Because my parents don't like painting their walls, I grew up in a white walled house for most of my life. Subsequently, I'm itching to paint the walls when I eventually buy my own place. However, as much as I love painted walls, black and white decor gives white walls a serious run for their money. 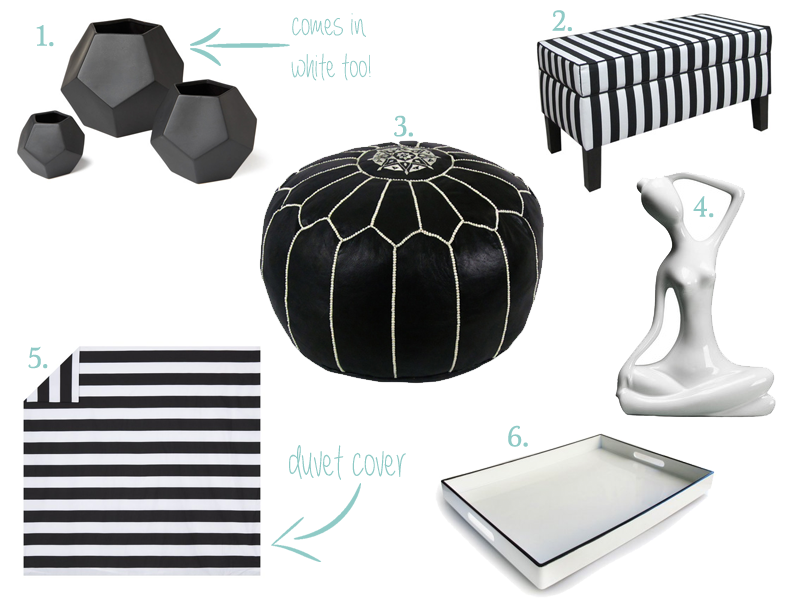 The beauty of a black & white decor is that any other color added to it would look fabulous. But for a luxurious touch, I really like black & white interiors with metallic accents in them. Some of the best black and white rooms in my opinion use naturally white or black materials - Carrera marble, black granite, ebony woodwork, white porcelain, a black & white spotted cowhide rug, sheepskin, or black slate just to name a few.